Perhaps your church is growing and you’re building a new location. Or maybe you’ve decided to give your historic church a bit of an upgrade. Either way, stained glass windows are a lovely addition. 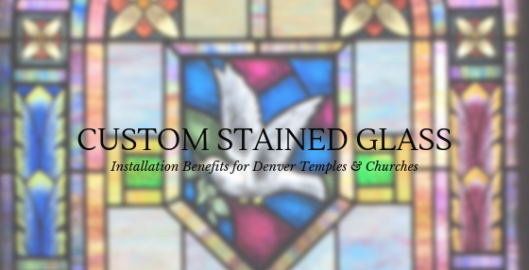 Here are some of the ways your church can benefit from custom stained glass in Denver. Worship is a sacred time of day. Plain glass windows exposure your members to the outside world and can distract them from the important message being delivered. Create privacy for your church by replacing the ordinary glass in your windows with bright, colorful stained glass. Many times, churches are recognized by members of the community because of their stained glass. Over time, the stained glass and the identity of the church become synonymous and a familiar site to members of the surrounding neighborhood or community. By installing stained glass, you can sculpt your identity within the community and share the important values and messages your organization believes in. Experience the joy and beauty of custom stained glass. Call Denver Stained Glass today to get a quote on stained glass for your church, temple, chapel, or cathedral.